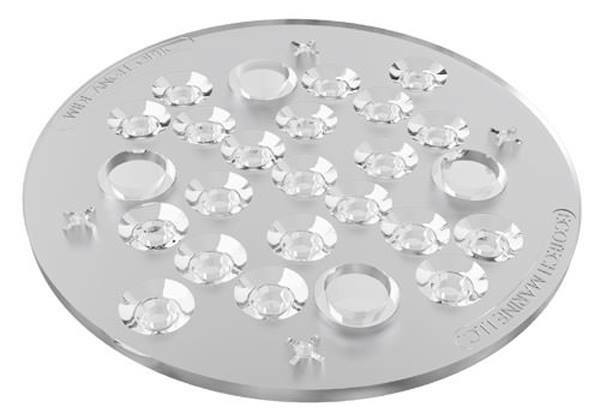 EcoTech Marine continues to roll out the goodies this year, with their latest coming in the form of a new set of wide angle Total Internal Reflection (TIR) lenses for the über popular Radion LED light fixtures. As their name suggests, the new wide angle TIR lenses really spread out the light, making them ideal for aquariums with a larger footprint or those that just need a little less focused light spread (think shallower tank, soft coral reef, etc). According to EcoTech Marine, the new lenses give a single Radion a spread of 36″x36″, as compared to the 24″x24″ given by the stock lens. According to the press release, which was released via Facebook, the new TIR lens kits are optimized for the highest PAR possible over the much wider area. While the light has been spread around, the Radion’s reach will still be up to 24″ deep. The TIR lens will be sold as an accessory, and will fit all models of the Radion that are currently on the market. The wide-angle lens kit, which consists of two individual lenses, will retail for $35 and is already available to purchase.